Some time ago a company called Chartwell created a gameshow-themed online slot called Triple Bonus Spin ‘N Win; Chartwell was subsequently acquired by Amaya Gaming in 2011 and that’s why you will find this game listed under Amaya these days. It’s a single payline releases but it also includes some extra features which give it a little added edge. It also features a progressive jackpot. 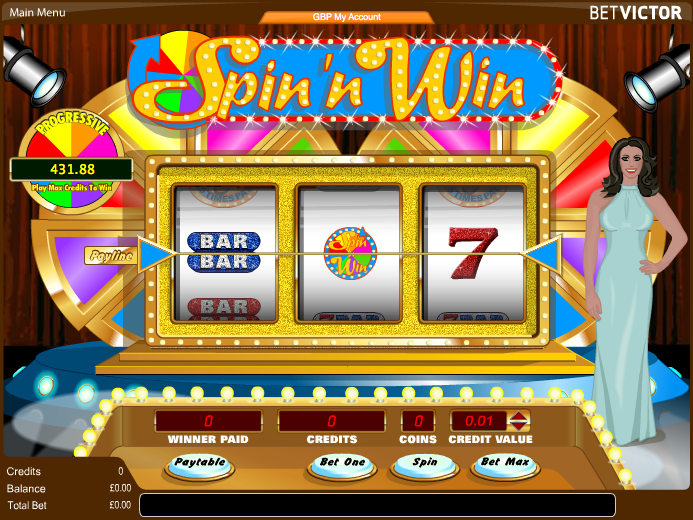 Triple Bonus Spin ‘N Win features three reels and just that one payline and the whole game is reminiscent of a Wheel Of Fortune-style of television game show. The difference here is that rather than a huge Wheel Of Fortune there’s a reel set which is equally sparkly and colourful and of course flanked by the obligatory girl in a cocktail dress. Most of the symbols are also sparkly and include a pile of cash, single/double/triple bars, sevens, and seven/bars. An icon with a big ‘5’ on it is the wild symbol, the Spin ‘N Win logo is not only worth the highest amount of 4000x your stake but it also acts as a wild. Finally there’s a ‘Spin’ symbol which will win you a free spin if you land three on the payline. Both of the wilds will pay you a 5x multiplier of your win if they contribute to it. The wilds can mix and match for a maximum of 25x your win for two in a winning combo. Please note that the following two features are only available if you are wagering the maximum of three coins per spin. In this case the free spin is a spin of a Wheel Of Fortune and it’s triggered by landing three of the ‘Spin’ symbols on the payline. The Wheel is broken up into segments each worth a vary gin amount of coins and when it stops it will reveal your win. 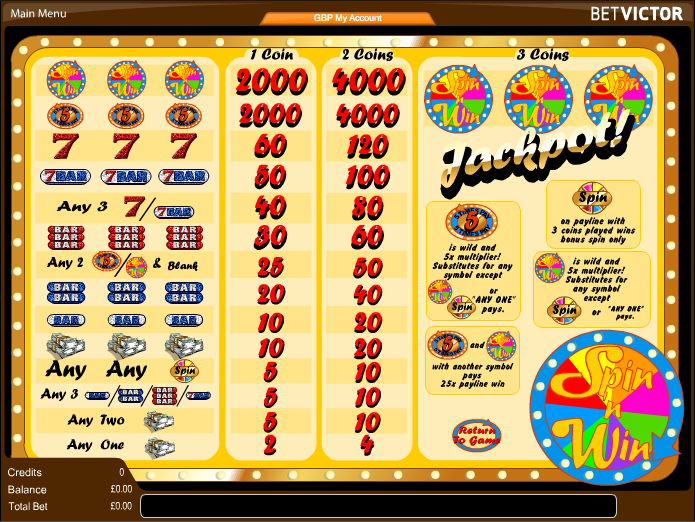 You can see the relatively small progressive jackpot amount to the left of the reels and the way to win this is to land three of the Spin N Win logos on the payline. This slot has some good features such as the progressive jackpot and the free spins but it’s let down somewhat by a very low RTP of 88-90% – not really enough to make this game worth loading up. Note that there is a similarly named game featuring five reels by the same company. Check it out here.